A Review of Larry Correia’s First Two Monster Hunter International books. We live in a world filled with evil, tangible human evil, but what if we lived in a world with all of that human evil and with the horrible, ugly, grotesque monsters of legend? What if vampires and werewolves were really out there prowling the streets? Surely a police force already burdened by the overabundance of human crimes couldn’t protect us from all these monsters as well? Fantasy author Larry Correia offers an answer to that question with his Monster Hunter International series in a very simple way: Corporate Monster Slaying. The books are told in the first person view point of a man named Owen Pitt, who after fighting and then throwing his werewolf boss out of a high rise building, finds himself recruited by Monster Hunter International. MHI is a company that kills monsters for money. The Government offers bounties for these monsters in order to keep the creatures existence a secret and keep the monsters at bay. The series in a very non-subtle way provides a look at private citizens who manage to see the evil around them and take action. While one might not agree with all of the conclusions of the characters in the books, which seem to lean libertarian in their viewpoint, one can see that the right of self-defense can even be elaborated on in fantasy novels and even championed in a B movie plot with plenty of good-ole-boys shootin-n-killin monsters. 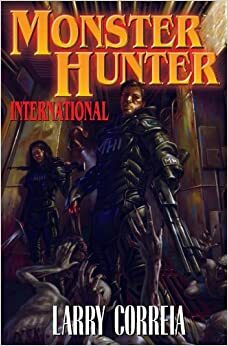 The first book in the series (Monster Hunter International) was self published by Mr. Correia and found great success online due to its action packed nature and very detailed description of firearms. Larry Correia, a former firearms instructor and gun store owner, prides himself in detailing with great accuracy the use of firearms in his books. This technical accuracy is quite informative and lends itself well to readers who have a decent knowledge of firearms and their usage. Because of the success that MHI found in self-publishing Mr. Correia was offered a publishing contract with Baen books and since gone on to write over 10 novels for Baen in three different series . The main problem that I find with the first book in the series is that it was not a very polished novel. Due to its self-published nature the novel suffers from pacing problems and its length, over 700 paperback pages, can seem overwhelming at times. Although the book clearly had problems the concept and desire to write simple yet fun stories about people shooting monsters with automatic shotguns was enough to make me buy the next book in the series. In Monster Hunter Vendetta Owen Pitt finds himself being targeted by an evil cult that worships the monsters that he thwarted in the first book. The second book expands on the promise of the first, but is improved by being only around 600 paperback pages. Throughout both of the books Correia subverts certain fantasy tropes and clichés, taking what is expected and putting a unique fun spin on it. His portrayal of elves is quite different than what we have come to expect since the days of the regal splendor of Tolkien’s Lord of the Rings, making something utterly unique and hilarious in the process. Correia manages to bring some much needed levity and simplicity to a genre that too often takes itself overly serious. With the amount of “grimdark” and post modern fantasy novels that are gracing the shelves of bookstores today Correia has become a welcome shotgun blast to the genre. His books are fun and engaging and provide an explosion of brightness in a time when most authors seem to only be relishing in darkness. While the books definitely have problems, length and pacing being the biggest their plotting and characterization are done pretty well and manage to keep a reader pressing on through the slower bits to see more action and monster hunting. One need only see that Correia has become a New York times best seller and frequently sits in the top 20 fantasy authors on Amazon to see that his popularity has blossomed since first releasing his self published debut. Along with this success have come improvements in his writing, making his newer books even better than these two already decent entries into his bibliography. One of which we will explore in another review at some point in the future.